If you wanted the best Buick had to offer in 1956, this was it – the Roadmaster. 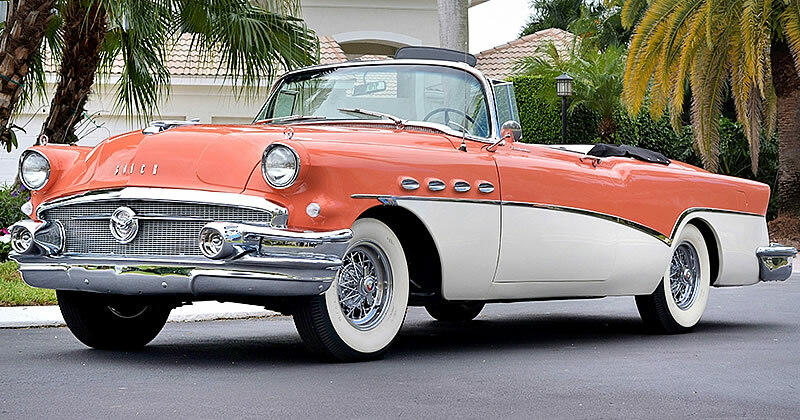 Although each of the four Buick series had a convertible in the lineup, the Roadmaster was top-of-the-line. With Buick being one of General Motors more prestigious divisions sitting just under Cadillac, you know this is quite a special automobile. In addition to being generally better appointed than other Buick models, the Roadmaster had a few touches designed to separate this top line model from the rest in the pack. The side sweepspear didn’t dip right down to the rocker panel as other Buick models and the deck lid featured two chrome strips. Buicks of the mid-fifties were quite distinctive with their full rear wheel openings. The other Buick feature that made them stand out was the use of ventiports on the front fenders – 1956 saw them become oval instead of round. 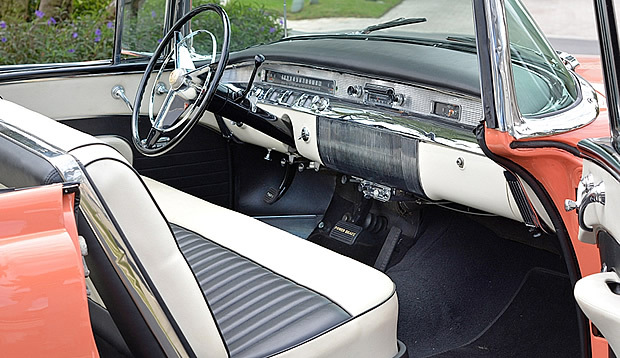 Inside is a luxurious interior that includes leather which was standard in the Roadmaster Convertible as was a powered convertible top and windows together with a powered 6-way front seat. Power steering and power brakes were also standard. In the center of the dash is a Sonomatic AM radio which was a $96 option when new. All 1956 Buick cars came with a 322 cubic inch V8. Specials got 220 horsepower whereas the others such as the Roadmaster got a 255 horsepower version. This is paired up with a Dynaflow automatic transmission which was standard on the Super and Roadmaster. Buick managed to sell 4,354 Roadmaster Convertibles for the 1956 model year at a base price of $3,704. To put that price a little more in perspective, the Chevy Bel Air convertible of the same year came in at $2,344 and came with less ‘goodies’ as standard.